American President Woodrow Wilson once described golf as “a game in which one endeavors to control a ball with implements ill adapted for the purpose.” Most golf travel bags fit his description to a tee. 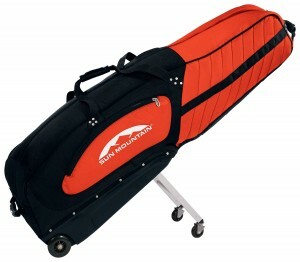 But Sun Mountain has designed a travel bag, called the ClubGlider that is positively brilliant. The key is the product’s spring-loaded legs and wheels, which are safely tucked in the undercarriage of the body. When extended, they enable the user to pull along this perfectly balanced travel bag with a mere fingertip. The “four-wheel drive” takes 100% of the load off your back. No more bending or lifting while schlepping through airports. Although the case is large enough for a tour bag, it’s also easily folded and stored. It’s roomy enough to hold your shoes, rain gear and plenty more. And now, as this Scotland Golf Road Warriors adventure come to an end, it seems that my luggage has expanded. So I’ll use my ClubGlider to transport home some souvenirs. Yes, to the folks back home, that means single malts and oatcakes are coming your way.Sun Mountain, an expert of golf bag design, has ensured that the padding and rugged exterior will be able to stand up to just about anything airport baggage handlers can throw at it. I’ve taken mine around the world and it’s still in good shape. Buy the ClubGlider and you’ll spend less time at the chiropractor and more on the fairways.